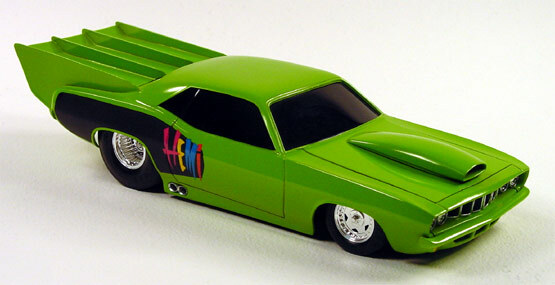 Here's a neat slam model I built back when Pro Mod Drag cars were just starting to get popular. I started with a Johan Sox and Martin '71 Plymouth 'Cuda kit and added a scratch built wing and rocker panel skirts. The hood scoop was modified from the Revell Matt and Debbie Hey T-bird pro streeter. The wheels came from the parts box and I hand painted the HEMI graphics .